Each week we print For Your Consideration, a feature where we take turns telling you about worthwhile stuff we’ve been reading, watching, listening to, etc. Now we’re trying the inverse: Each Monday we have a single topic with recommendations from several Inlander staffers. Read previous posts here. I have a confession. I am addicted to watching people getting murdered. If you haven't heard of it, the premise is simple. A talented cast of actors tells a horror story — and yes, it’s American — in one season, all focused on a particular theme. The first 12 episodes feature a haunted house, the next 12 an asylum, and the current season a coven of witches. Catching up won’t be very hard as the first two seasons are streaming on Netflix, and the plot moves quickly. Watch the pretty people get killed. You know you want to. Don’t watch this one with your significant other. Probably best to watch Before Midnight separately and then discuss. It’s the third installment of the Jesse (Ethan Hawke) and Celine (Julie Delpy) love story saga. In the ‘90s we saw the characters fall in love, just walking and talking in Vienna in Before Sunrise. 2004 saw the characters meet back up to walk in talk in Paris in Before Sunset. This decade, it’s walking, driving and talking in Greece in Before Midnight. The characters have twin girls together and are finally in a committed and loving relationship — that is until a night away in a hotel room brings up all the garbage they haven’t said in years. And Lord have mercy, the argument they have is the most authentic row ever put to film. You’ll laugh through it because you’ve said all of this crap too. It’s so real, it hurts. Many critics have named the Richard Linklater-directed film as one of the best of the year. They aren’t wrong. The script, written by the two stars and director, is absolutely brilliant. 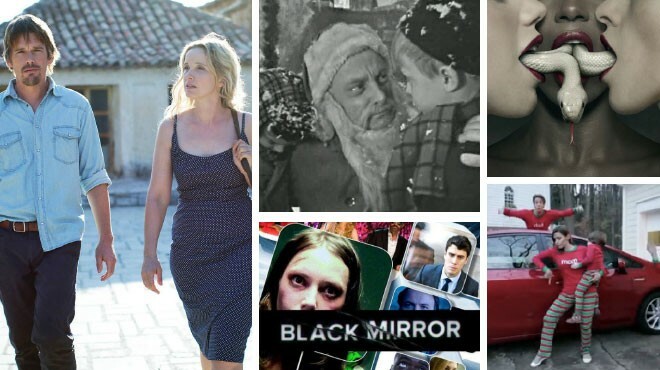 File Black Mirror in with the stuff in life that makes you uncomfortable in the good way, the shows/movies/books that make you think about the world in which we all live and then cringe. This dark futuristic series, created by British media critic Charlie Brooker, puts its viewers in a different universe with different characters for each of its six episodes, but certain themes remain. We're forced to look at the role technology plays in our lives and the way we may be living, as Brooker has written, "in 10 minutes' time if we're clumsy." As you watch, you'll find yourself wanting to look away — probably to the technology the show is forcing you to ponder — but by the end you'll sit still, left to wonder what the show, the characters and your reaction say about you and about all of us. Down with a head cold much of the weekend, I held my own streaming TV marathon of the 1960s classic The Twilight Zone. Rod Serling's amazing series of bizarre sci-fi morality tales holds up better than any other show of its time — complete with cartoon-like technology and Cold War paranoia. Via asteroid-exiled prisoners, burned-out boxers and demonic children, the show holds up an enlightening fun house mirror, reflecting modern parables and previously undiscovered fears. I recently realized Hulu streams dozens of episodes for free, automatically queuing them up one after another for hours of continuous enjoyment. For a not-so-unsettling, holiday episode, check out "The Night of the Meek" about a drunken department store Santa finding his true calling. Have you seen the “Christmas Jammies” video that’s gone viral? If not, bless your heart for somehow avoiding the entire Internet for the past week. It’s the perfect mashup of everything we’ve come to hate about braggy holiday cards and catchy viral videos. Oh, your daughter named Lola can count to 100 in Chinese? Oh, you have a pretty new Prius? And your Ken doll of a father can pull off a pretty good parody of Will Smith’s “Miami”? Worst of all, they all seem to have a healthy sense of humor about it. But it turns out the whole thing is partially a promotion for their video production company — so apparently they’re good at that, too. All that aside, it is entertaining. And I’m waiting for the parody showing how this idea would go once those cute kids turn into teenagers.